So you only get one thing, but the "double" is that this is both a sign and a restaurant recommendation. 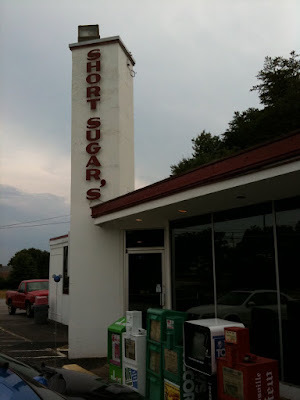 If you're ever in Reidsville, NC, I suggest Short Sugar's. They've been in business at this location since 1949 selling NC BBQ, and it's pretty good. The atmosphere is nothing to write home about, but you can pull up to the side of the building and eat in your car if that bothers you. They come to you for service and that area is shaded as well. Can't beat that. Nice pic and thanks for the data!! !